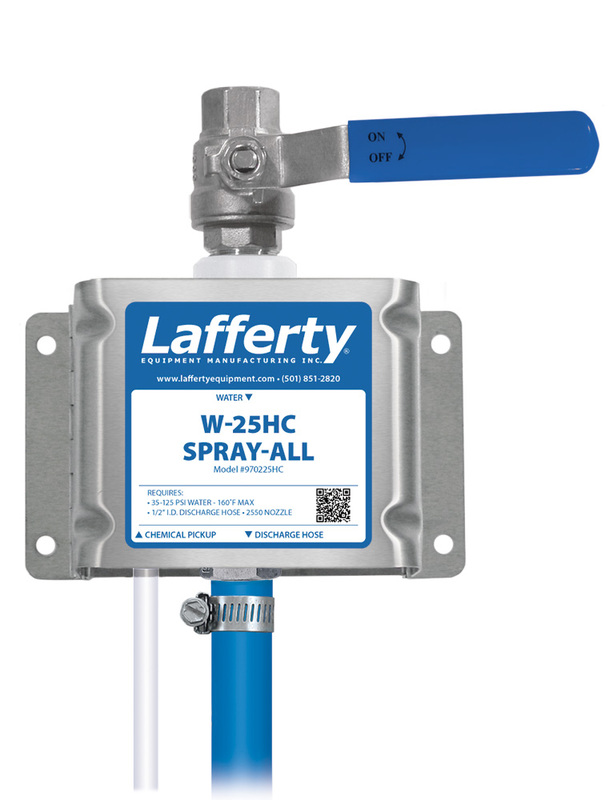 W-25HC Spray-All | Lafferty Equipment Manufacturing, Inc. The W-25HC Spray-All is a "high concentrate" spray applicator that will achieve strong dilution ratios for the toughest cleaning jobs. This venturi injection system uses standard city water pressure (35 - 125 PSI) to draw and blend chemical concentrate into the water stream to create a very strong chemical solution. The diluted solution is then projected through the discharge hose and fan nozzle as a uniform spray on to a variety of surfaces. Weaker dilution ratios are achieved with metering tips. With a flow rate of just over 1 gallon per minute, this unit is great for spraying virtually any sized area or object quickly and completely.